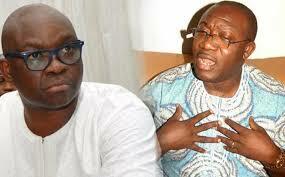 Fayemi fires back, says Fayose’s ‘Kangaroo panel can’t probe me’ – Royal Times of Nigeria. Asked if setting up a probe into Fayemi’s tenure isn’t witch-hunt, both the SSG and the state’s Commissioner for Justice, Owoseni Ajayi clarified that the development was in strict adherence to the law of the state, incidentally signed into Law in 2012 by Fayemi himself. Kayode Fayemi, minister of mines and steel development, has told Ayodele Fayose, governor of Ekiti state, that the inauguration of a judicial commission to probe his administration in the state is an exercise in futility. Speaking through Yinka Oyebode, his media aide, Fayemi said the governor’s action is at variance with the laws of the land which makes it sub judice for anyone to entertain a matter that is already before a court of competent jurisdiction. He said Fayose’s decision to go ahead with the inauguration of the panel, while two cases arising from the planned probe were still pending in court is presumptuous and ill-advised. “It is obvious, Governor Fayose is desperate to probe the administration of his predecessor in office, Dr Kayode Fayemi, for personal vendetta,” the statement read. “Yet, he is advised to be guided by the rule of law and decency in this wild goose chase. “The governor and members of the panel are reminded that the two cases involving the house of assembly, its leadership and top officials of the present administration are still pending In an Abuja high court and a federal high court in Ado, thus making it an act of illegality for another panel to look into the matter. Fayose has given the panel headed by a retired judge, three months to submit its report.